While steam ovens may have only just been popular in residential kitchens, the concept has been around for centuries. Steam cooking dates back to ancient China. Steam cooking techniques were also used in Europe in the 18th century, with steam ovens found in bakeries, restaurants, and home kitchens. Increasing popularity of steam ovens in the US can be attributed to our shared desire to cook healthier. In addition, to meet the demands of their customer base, many of our favorite appliance brands are now bringing their own models to the market. If you are planning to renovate your kitchen, you may like to learn about how you can create perfectly cooked recipes for your family with limited fuss. Think nutritious and delicious dishes that are moist and tender on the inside, and crisp and flaky on the outside. If you resent your conventional oven for the way it dries out your food, a steam oven provides constant moisture without the need to use oils and is a simple and effective way of preparing a large variety of foods. Water boils within the oven, where steam is captured and held at variable temperatures ranging from 212°F anywhere down to 85°F. Steam ovens are different from steam assisted cooking found on some regular ovens. Nowadays, some oven brands incorporate steam action to finish off certain recipes. Do not confuse these with convection steam ovens. Beyond just steaming vegetables: What is a convection steam oven? Many steam ovens have only a steam function, but this limits you on the cooking that you can do. A "combination" or "convection" steam oven combines both steam and convection oven settings to give you much more versatility. Combining steam with convection allows you to cook a larger range of dishes, making your cooking balanced and meaning you won’t need to use your regular oven as much. Steam mode: You can use this mode to hard-boil eggs, poach fish, steam vegetables, rice and even to make sauces and desserts. It’s also an excellent setting for reheating leftovers, so instead of getting dry and tasteless results like you usually do with a microwave, your food will be gently rehydrated while warming up. The steam mode is a valuable setting for defrosting frozen foods quickly. Convection steam mode: With the combination of steam and convection oven settings, you can cook food to perfection. Many of your favorite dishes such as macaroni cheese or roast turkey will turn out nice and juicy on the inside, and crisp and brown on the outside. This setting seals in moisture, flavor, and nutrients, and often provides a shorter cooking time than other conventional cooking methods. Courtesy of Wolf - Cooked in a Wolf Combo Steam Oven - "Filo-wrapped ice cream. Hot, delicate, crispy-brown pastry surrounds ice cream still firmly frozen." Using a convection steam oven brings several benefits to you and your family. Healthier food: Steam helps retain the nutritional value of food and there is no need to use oil to keep your food moist, so you can keep your family’s diet healthier. Better tasting and better-quality food: Since steam does not lose the moisture from your food, you will find that your produce has better texture, flavor, and color than you would have with other cooking methods. You will also notice that there is no flavor transfer and you can reheat dishes without drying them out. Versatile: You can use your steam oven in place of a traditional wall oven with different applications. All kinds of cooking dishes can be used including glass and metal. Saves time on cooking and cleaning: The smaller cooking cavity allows for a faster preheat and the steam makes cleaning up much more comfortable. Cook multiple dishes simultaneously. Since there is no odor transfer between the dishes, you can cook different dishes on each rack. What can I cook in a convection steam oven? Steam ovens are useful for making several of your favorite dishes. In the past, they had limitations with steam only setting but now with convection baking added along with a top broiler (as in the case of Miele and Bertazzoni) you can even brown your meat dishes. If you have a strictly steam oven, you will need to do a range-top sear after steaming. Do steam ovens need plumbing? Plumbing isn’t required for many steam ovens, which makes them easier to install in whichever place in your kitchen you would like. These ovens do need water though to be able to produce steam, so you’ll find a small water tank on the side (of top section) of the oven which will need to be refilled as needed. Some oven models can be hooked up to your plumbing system, which may be a more convenient option for you if you don’t like the idea of having to keep refilling the water reservoir. Are steam ovens hard to maintain? Not at all. Think of the steam over like your coffee machine. It is best to decalcify the steam oven periodically (most brands have automated reminders, so you get the peace of mind). By nature of their operation, Steam ovens are easy to wipe clean. As the significant innovator with 19 combination steam ovens to their name, Miele makes steam food preparation a breeze with a model to suit all homes and cooking requirements. While they do offer one steam only model DG6500 / DG6600 at $2,600, it makes more sense to install a combination oven if you’re going to make space for one due to their versatility. 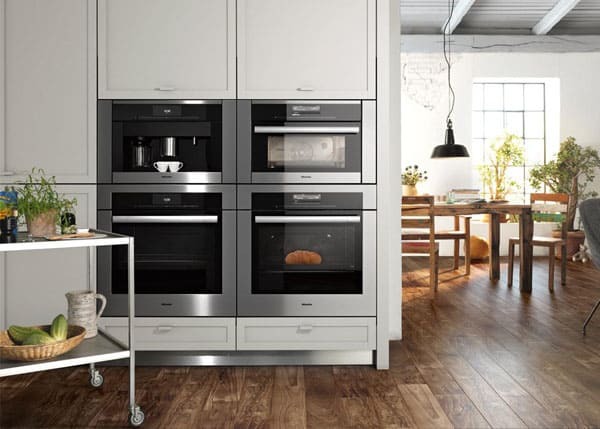 Miele has both the PureLine and ContourLine design groups, each with their unique style so you can find the right look for your new kitchen or match in with your other appliances. You have either plumbed or "non-plumbed water tank models" to choose from. Miele offers many color options such as white, black, stainless steel, or graphite gray. MasterChef programming: This function comes pre-programmed with 200 recipes, so you don’t need to worry about setting the time or temperature before cooking. M-Touch Controls: The best interface we have seen in the industry with frustration-free touchscreen controls. Reserved for the higher-end Miele models. MultiSteam Technology: With this technology, steam is generated fast and distributed via 8 jets to ensure uniform cooking results. Remote Vision Control: Should anything go wrong with your steam oven, this revolutionary feature enables Miele’s customer service to maintain it remotely. Broiler element: This feature certifies Miele as a full fledge convection oven and takes combination steam oven to a new level. Sous-Vide cooking: Miele combi-steam ovens are great for Sous-vide cooking which requires low and even temperatures for an extended duration. Along with the EVS6114 24" vacuum seal drawer, you can be the sought after Chef for your family. Starting the Miele range of combi ovens is a base model priced at $3799, Here are some of the features of DGC65001XL. Cook Roast Bake: This full oven function allows you to cook foods such as roasts and baked goods just like you can in your regular oven. PerfectClean: Cleaning is a breeze as there is less food residue sticking to the oven surfaces. No odor transfer: You won’t need to worry about cooking fish with other dishes since there is no odor transfer. XL Cavity & Sabbath Mode: Offers 48 liters of usable capacity, giving you room to cook larger items of food or dishes for 8-10 people. Temperature probe: Informs you when food has been cooked to perfection. No need to open and reopen the door. You can take the guesswork out. Also available: PureLine DGC66001XL with straight handle is the sister product for this unit. Next level up at $4199 Miele introduces the M-Touch controls we explained above. Plumbed units start at $4499. If you are looking for a taller, full-sized oven, the XXL models are ideal for larger families. Again, you can find both PureLine and ContourLine designs as well as the choice between water reservoir or plumbed options. Model DGC6760XXL features the XXL cutout which gives you extra interior volume with 2.51 cubic feet compared to 1.84 cubic feet in the XL models. You also get an extra 4th rack which provides you with the ability to cook more dishes in one go. The great thing about Wolf convection steam ovens is that they have many distinct design options. The Wolf stea oven gives you the flexibility to blend in with your other Sub Zero/Wolf products in your kitchen. Wolf features 7 models including 24” and 30” width units. Wolf steam ovens do not require plumbing and use only their water reservoir, making installation convenient. Besides, Wolf convection steam ovens can be installed flush with your cabinetery. Wolf made significant developments in their convection steam technology. In fact, in 2018 the entire line up was updated with enhanced cooking technologies. 10 Cooking Programs: Allows you to mix precisely the optimum amount of heat, steam and airflow. Using these programs you can roast a chicken, bake chocolate brownies and steam asparagus. Baking bread is a winner in Wolf Convection Steam oven. Keeping foor warm before serving, reheating or defrosting can be done without a problem. Gourmet Mode: Operates like Miele's MasterChef, albeit considerably fewer recipes in Wolf. However, all Wolf covers bases. Simply select the type of food from the menu, and Gourmet Mode will prepare your food with precision. Wolf recently introduced a vacuum seal drawer VS24 for Sous-Vide cooks. This drawer can be installed either as 24 inch width or as 30 inches to match with other ovens. Thermador made major changes in the design and performance of steam ovens as of September 2018. The new Professional and Masterpiece steam ovens are perfect for culinary enthusiasts with a large 2.8 cu. ft. cavity (in single ovens). You do not need specialized plumbing for these models as they use a water reservoir. Thermador also incorporated steam ovens in their double convection oven configurations to address the needs of customers who would like to maintain healthy cooking habits. Moreover, Thermador steam ovens can now be installed fully flush in your cabinets. This was a main sticking point for many designers as the previous incarnation of the product was not meant for flush installations. You can check out our video on this great little model and learn all about its features here. Bertazzoni, Master or Professional Series 30" Built-In Convection Steam Ovens. Samsung, NQ70M7770DS 30" Double Oven - Upper oven is a "Speed Oven" which means a microwave with convection cooking abilities and the Lower oven is a convection oven which also acts as a steam oven. As a bonus the lower oven comes with the FlexDuo smart divider so you can cook 2 dishes at the same time. We here at Designer Appliances love using convection steam ovens and are excited for your family to enjoy this natural way of cooking nutritious and tasty meals. It’s important to take some time to browse the ranges available and choose a model that blends in well with your kitchen and offers features that you can utilize. If you’re having trouble deciding which brand for you, feel free to give us a call or come and visit us in store, and we’ll happily go through the options with you. Once you get the hang of your steam oven and understand the right cooking techniques (there can be a bit of a learning curve if you want to get adventurous), you’ll wonder what you ever did without one.